Deepen your understanding of pathology from a body/mind approach. Learn key concepts about how to recognize and confidently respond to soft tissue and movement therapy indications, precautions and contraindications for the cardiopulmonary system. This course also provides an excellent reference after the course is done. Lots of great information, easy to understand. Convenient and affordable, didn't have to travel or spend a lot of money on a class. Extremely relevant information and topics. A delight to find such informative information on such advanced subjects. I always study with a marker in hand and highlight all useful information. My whole course is now a glowing yellow! Your course is excellent! All of this information is extremely valuable to me, both personally and for my clients, most of whom are over the age of 70! Thanks for the clear presentation of complex and detailed information. Lots of important information. I will be reviewing and making charts to assist during health history taking with clients. This course was awesome. So much information that will be so helpful in my daily life as well as my practice. I really enjoyed this course and will definitely be able to use it in my daily work! Very clear. Shows IIHS has been hard at work refining and revising the material. And I learned a lot of new material. I loved this one! Challenging yet easy to follow and very informative. Much information to gain...great review as well. This course allowed me not only to review what I have already learned but to refresh my memory in matters that I might have forgotten. I will appreciate having this information on hand to be more aware. I found this course to be extremely helpful. It's easy to get complacent after comfortably working with many clients for 27 years without incident. As I age, so do many of my regular clients. I would highly recommend this course to colleagues as an invaluable refresher. 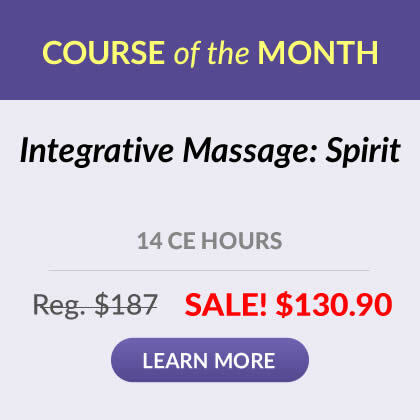 This course helped me grow as a massage therapist. Excellent course for anyone. Good knowledge is working with an elderly client. Lots of great anatomy!!! Great refresher and excellent information to use in my practice! Thank you! This course was excellent!!!! Very important and enlightening. Thank you for providing great and informative courses. This course provided me with excellent information that will benefit me and my clients in my massage practice. The age old question: What do you know about what you don't know? This is material I will re-read and keep close at hand, and share with my clients. There is just so much to understand and know from the physiological side---it over taxes the mind with just how fascinating the body is and how marvelous it all works together to create homeostasis. So glad I stumbled on this course. The site for the Institute is very user friendly. The course was not as hard to navigate as I thought it would be. 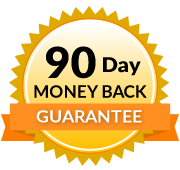 Overall I am pleased with the experience of this online training as well as the detailed instruction. Helpful course. Very detailed information about cardiopulmonary function and symptoms. Also interesting research findings and case presentations. Thanks ! A wonderful review of the cardiopulmonary system. Valuable information that will benefit my massage practice. The information presented was up to date and very understandable to layman as well as professional. This gives appropriate information so that a discussion with a client regarding appropriate therapy can accomplish a lot for both of us! Good course and user friendly with all the information to finalize with 100% score. very pleased! This course was very interesting for my personal health as well as for my clients. Thank you for this online course. Very well done for a complicated and important topic. It was excellent. I can use it in my practice. I am really glad I took this course. Very well presented information, repeating as necessary to assist in learning. A great refresher that will be very helpful with my clients. VERY INFORMATIVE MATERIALS. A VERY SENSIBLE, WELL THOUGHT PRESENTATION OF SUBJECT MATTERS. Define: lymphedema, heart failure, stroke, COPD, hypertension, heart attack, asthma, ischemia, PVD and embolus. Recognize the appropriate actions in response to signs of heart attack. 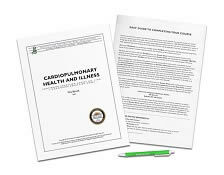 Identify five contraindications relating to the cardiopulmonary system and five cardiopulmonary signs and/or symptoms that are reasons to refer the client to a primary care provider. loss of consciousness (in severe cases)"
lie him down with his feet elevated. question him about his heart history. drive him to the nearest hospital immediately.